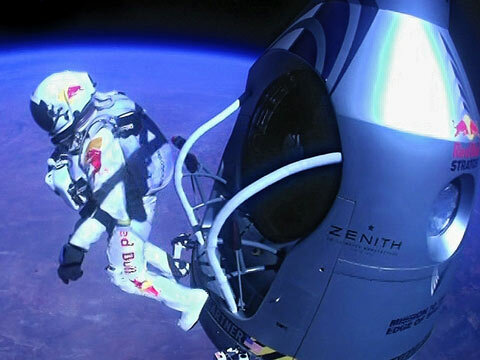 ere explain why Baumgartner did not break this third world record. Joseph Kittinger holds the record for longest free fall that Baumgartner was trying to break in 1960 where he fell from 102, 800 ft. The reason that Baumgartner was unable to break this record is the atmospheric pressure, or lack there of, in the stratosphere (a main portion of atmosphere that through which Baumgartner fell). The pressure and density of this sphere is very low, causing very little drag. This is because density and pressure decrease with altitude. The only force acting on Baumgartner is gravitation pull, and with this force he continued to accelerate, reaching speeds over 800 mph. While in the stratosphere, Baumgartner experienced his worst nightmare concerning this mission. He began to spin uncontrollably. When he left the balloon with his hands in the air, he fell forward with the axis of rotation being horizontal at his hips. Any change in his body position altered this axis of rotation, even if just a bit. Consequently, the axis of rotation shifted, resulting in the “tumbling” which he experienced, but was later able to get under control. He was unable to stop this tumbling and spinning initially because, in the Stratosphere, there are fewer air particles to create resistance against his body. Undoubtedly, the additional problem of his helmet visor fogging up created further concern for Baumgartner as he tried to locate the emergency chute, in case he was unable to stop the uncontrollable tumble. Fortunately, he was able to gain control of his body and the tumble became less severe, as discussed below. icles, enabling him to contort his body, helping him regain control. Once in control, he was able to align himself in proper position to release the parachute. Before he released the parachute, he reached his terminal velocity. This is when the force of gravity equals the wind resistance, the force of the air particles pushing up on him. After he reached terminal velocity, he began to slow down to 170 mph. At this point, he had a high level of drag.